From left to right: Alice Zhai, ASCIT social director; Kavya Sreedhar, ARC chair; Gabby Tender, Dabney president; Diandra Almasco, Blacker president; Sandra Liu, Ruddock president; Grace Chen, IHC secretary; Rachael Morton, IHC chair; Amanda Lin, Avery president; Dana He, ASCIT secretary; Sara Adams, ASCIT director of operations; Sarang Mittal, Lloyd president; Sarah Crucilla, ASCIT treasurer; Sarah Cai, Page president; Vinciane Chen, Fleming president. Missing: Noah Huffman, Ricketts president and Sakthi Vetrivel, ASCIT president. At the Overlake School in Redmond, Washington, Sakthi Vetrivel had a reputation for being shy and quiet. That changed when she arrived at Caltech. During the fall term of her freshman year, Vetrivel was invited to help coordinate Techstock, the annual Caltech and JPL battle of the bands. "Very early on, I got the chance to jump in and organize a significant project," she says. The experience helped her recognize the major role undergraduates play in leading events and programs on campus. 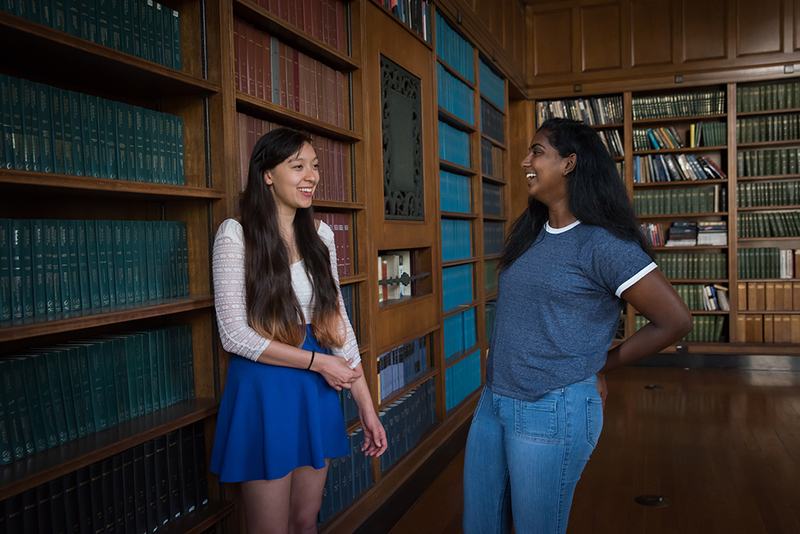 "Students have a lot more influence than they might realize," says Vetrivel, now a junior and president of the Associated Students of Caltech (ASCIT). Elected by their peers, Caltech's student leaders allocate funding for clubs and activities, manage the rotation system in which new students are assigned housing, help administer the Institute's Honor System, and shape many other aspects of student life at Caltech—all while honing collaboration and consensus-building skills they hope will advance their future career and research goals. But Vetrivel and her fellow ASCIT and Interhouse Committee (IHC) officers—nearly all of whom are women this year—say their most important charge is fostering a sense of campus community and connection. "I really enjoy representing our student body," says Vetrivel, who is studying computer science and business, economics, and management. "We're incredibly diverse, and there are a number of issues that students are passionate about. As a student leader, I have an opportunity to be a voice for them." According to Lesley Nye, associate dean of undergraduate students, leadership is a fundamental part of the Caltech experience, one that builds confidence but also an ability to compromise. "Students have a voice at Caltech," Nye says. "That's true of other campuses, but because we're such a small institution, it's more tangible. We give students a lot of responsibility. We listen to them, and we engage in dialogue with them. Leadership experience encourages students to form alliances and, hopefully, to represent the voiceless." As IHC chair, senior Rachael Morton counts a willingness to seek diverse perspectives as an essential leadership quality. She hopes to facilitate more open communication among Caltech's eight student houses as well as between students and administrators. "I try to listen to all viewpoints," says Morton, who studies computer science. "I'm pretty open. I'm not very stubborn. I'm willing to reformulate my thoughts." For Gabby Tender, Dabney president, leadership is an opportunity to strengthen bonds among students. "I want Dabney to be a welcoming place, for us to build cohesiveness," she says. She hopes to engage more of her peers in house decision making and planning, and believes leadership experience is good preparation for a career in academics. "I would love to be a professor," says Tender, a senior in chemistry. "Being able to work with people to achieve a common goal will be important. I think student leadership is a very useful experience, learning to fight for a whole group's interest." That this year's student leaders are predominantly female is welcome news to Jarrid Whitney, executive director of admissions and financial aid. "This is something I am very proud to see," he says. 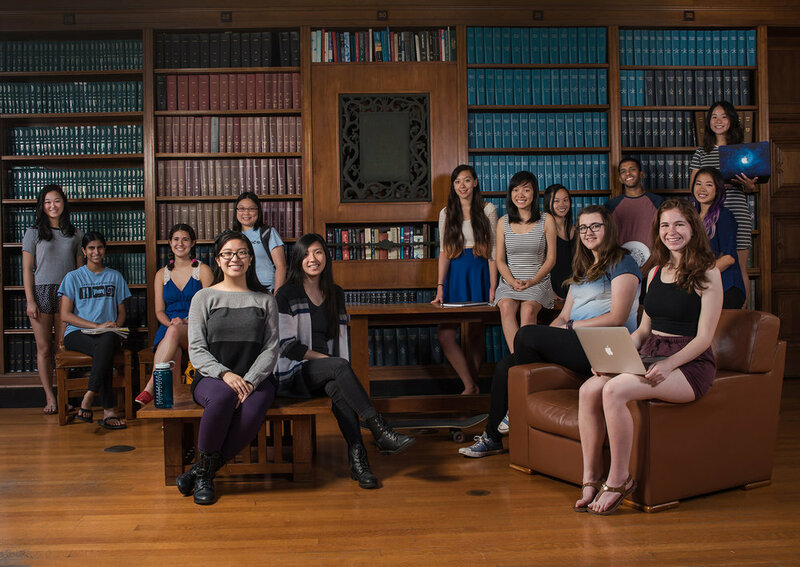 Over recent years, through initiatives including the Women in STEM Roundtable held during Prefrosh Weekend, the Institute has worked to draw more women and members of other underrepresented groups to campus. "Science is best when you have diverse perspectives at the table," Whitney says. "At the same time, we don't lower our standards for anybody. We have always selected the best and brightest." This year's group of admitted applicants was one of the most diverse yet, with women so far accounting for 46 percent of the incoming class, tying an Institute record. "It's exciting to see our efforts paying off and to see student leaders realizing their potential," Whitney says. For her part, Tender is encouraged but not necessarily surprised that so many of her leadership colleagues are women. "People never questioned why it was so male-dominated in the past," she says. "I think it's important that everyone has a leader they can see themselves in. It might change how people view leadership. It might change opinions about who makes a good leader and what good leaders do."